Red River Real Estate and Vacation Rentals - Claim Jumper Townhouse 7, Red River, New Mexico. Claim Jumper Townhouse #7 is an end unit that’s been newly renovated with two bedrooms, two and a half bathrooms and is located in the hottest spot in town on the river. This townhomes is a two level property with both bedrooms on the upper level. As you walk through the entry of this townhome you will immediately notice the eye catching the wood burning fireplace, leather furniture where you can spread out and watch cable on the flat screen TV or a movie on the DVD Player. Alongside the living room you is the dining area and fully equipped kitchen. The kitchen is filled with cabinet and counter space along with stocked cupboards filled with cookware, dishes and utensils. To the side of the kitchen you will notice the half bathroom. Up the stairs you will find two bedrooms; the first bedroom at the top of the stairs is the king’s room, literally! This room s furnished with a king bed, TV, private bathroom and balcony that look towards the ski area and fishing ponds. Moving on to the queen’s bedroom you will find a queen sized bed, TV, private bath and window that overlooks the trout stocked rushing Red River behind the Claim Jumper Townhouses. Back down stairs, at the back of the kitchen you will find the rear door leading you out to the fenced in concrete patio with a charcoal BBQ grill and outdoor furniture; through the gate you will find the common areas, picnic tables, BBQ grills and the river. 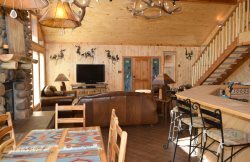 Other amenities that guests have to enjoy are free Wi-Fi, Out the door fishing and ski-in/ski-out! No trailer parking at units. All trailers must be parked in the municipal parking lot located behind Hillcrest Bank. Two bedrooms, two and a half bathrooms. Near the Red River Ski and Summer Area and town fishing ponds. Two story townhome with only a few steps to the entry. One king bed, one queen bed, one queen sleeper sofa. Both rooms are spacious and have access to private bathrooms. Living room includes flat screen TV, DVD player, and a wood burning fireplace. Claim Jumper Townhouse 7 provides cable, free WiFi, and a charcoal BBQ grill. Claim Jumper Townhouse 7 pet policy: Sorry no pets! It has been one of the best vacations we have had in over 10 years. Very family friendly and beautiful! The extras that were put into the package like the free movie rentals and the staff service was great! We will definitely be planning another trip to Red River soon! Thanks for helping make wonderful memories!! We had so much fun and our experience with Red River Real Estate was excellent!